Several different ways are used to express the concentration of sugar and alcohol in liqueurs. The choice of which way to express the concentration will depend on the local legislation and on the purpose for which the concentration will be used. This calculator will convert between any two pairs of concentrations for sugar and ethanol simultaneously. For example, sugar loadings are often specified in Mass per Volume terms such as gram/liter or mg/100ml, but it is easier to measure out and add the sugar in Mass per Mass terms such as Weight % or Brix. Similarly, regulations for alcohol content are usually given in Volume % (ABV) or Proof but it is more accurate to measure the spirit and liqueur product in mass terms. Any given combination of alcohol, sugar and water concentrations will have a particular density (at a specific temperature), so this calculator is also able to convert between density and concentration. This makes the calculator very useful for checking the consistency of laboratory results, or even to predict unmeasured concentrations. A typical laboratory analysis for process control (and to meet tax regulations) would involve measuring the density (or SG) of the liqueur, as well as its sugar content and alcohol Volume % (ABV) or Proof. This calculator will quickly check whether the 3 measured values are consistent with each other. Or if only two of these parameters are measured it will give a rapid indication of the third value. So if you have accurately weighed out your spirit and sugar you will know the sugar content on a mass basis, and measuring the density of the liqueur will immediately allow you to calculate the alcohol content in Mass %, ABV or Proof terms. On the calculator shown below, you simply select the values that you know as the "From" options and select the values you want to convert to as the "To" options. If the conversion that you have selected requires the temperature then the program will request you to enter that as well. The units for the input and calculated values are set, the input values entered, and the answers are calculated automatically. If the conversion requested is impossible then an error message will be shown in the Status Bar at the bottom of the calculator. Like all the AlcoDens LQ calculators, the Liqueur Composition Conversion Calculator can use either the OIML (in vacuum) or the TTB (in air) model. The model currently in use is always highlighted by the button with the red text in the top right corner. In this example knowing that the sugar loading is 10.00 Mass % and that the liqueur density is 1.01679 SG enables us to calculate that the alcohol strength is 35.50 Proof. 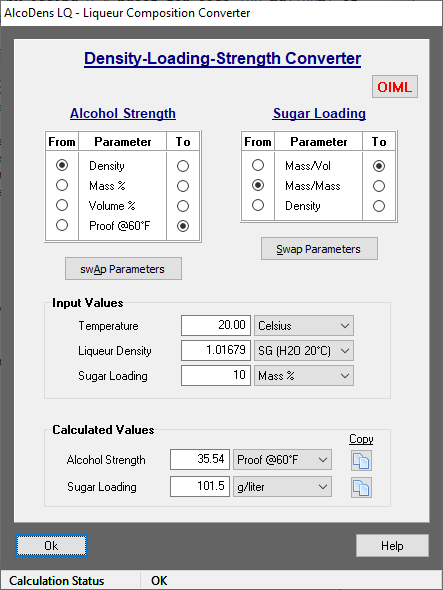 The alcohol strength could be expressed in Volume % or Mass % terms simply by selecting that option in the "To" column of the Ethanol Strength panel. The calculator has also converted the sugar loading into g/liter terms for us.